Deck of Bicycle-brand, poker-sized cards. Each card features 1-1/4-inch high numbers. High-contrast white letters on dark red backgrounds for hearts and diamonds, and black backgrounds for clubs and spades. An easily-understood code for quick suit recognition. If playing a simple game of cards has become somewhat of a chore due to the hard-to-see cards, perhaps it's time for a large print deck. 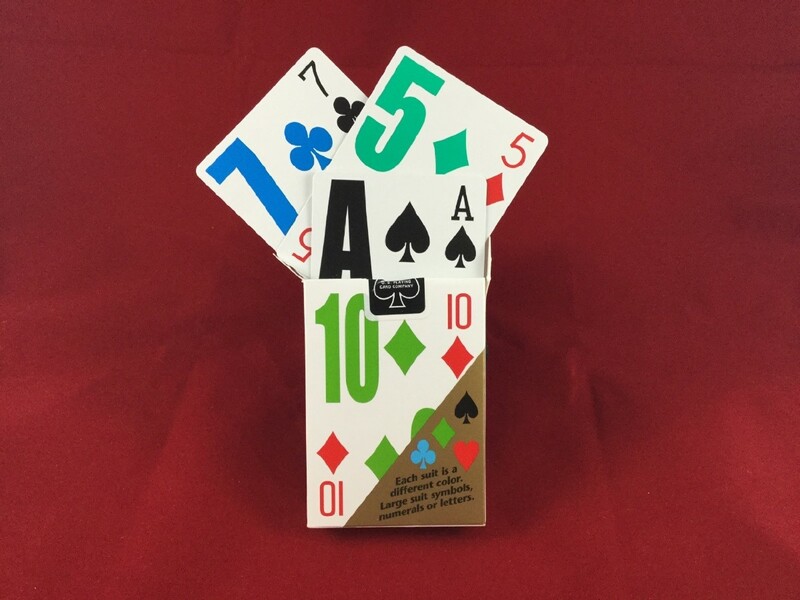 These popular Bicycle-brand, poker-sized cards feature big 1-1/4" high numbers which are easily read by folks with low vision. 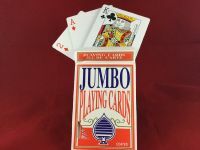 The cards boast high-contrast white letters on dark red backgrounds for hearts and diamonds, and black backgrounds for clubs and spades. Lastly, these cards have an easily-understood code for quick suit recognition. Most people who already have a deck of these cards agree that it's well worth the small investment, and makes poker tournaments and family card games alike fun again - for all of the players!